I never really knew this cemetery existed. But apparently this gravesite, tucked into the woods at the intersection of Spier Falls Road and Locust Grove Road in Corinth, still holds a few souls at rest. This website lists all the known cemeteries and graveyards in the Greenfield / Corinth / Porter Corners area in Saratoga County. And apparently this small gravesite was a Quaker cemetery, and was constructed in front of an old Quaker meeting house. If you drive down Locust Grove Road in Corinth, and you don’t immediately look to the side of the road, you’ll drive right past the gravesite and never know that one existed. As I said before, it’s a very small plot, with maybe four or five in eternal rest. The stones themselves are worn and damaged. One stone, however … is still readable. 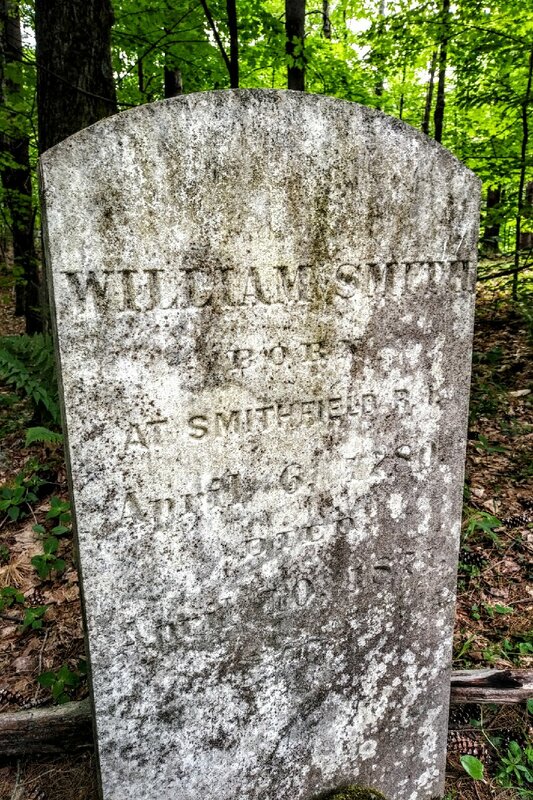 It’s the stone of William Smith, who lived from 1780 to 1871. Records in 1871 note that he was a farmer with a nearly 90-acre farm in the area of North Greenfield. That’s all I’ve found on him. No, I don’t think we’re related or anything. I was in the area at the time. And I had my Rolleiflex Automat MX with a pack of infrared print film inside. So let’s experiment. What will a stone grave marker look like in the shady Adirondack foliage? I don’t have much sunshine to work with – this marker is in a very shady locale – so I’ll boost my aperture up to f/3.5 and hope for the best. William Smith. Rolleiflex Automat MX camera, color infrared print film. Photo (c) Chuck Miller, all rights reserved. 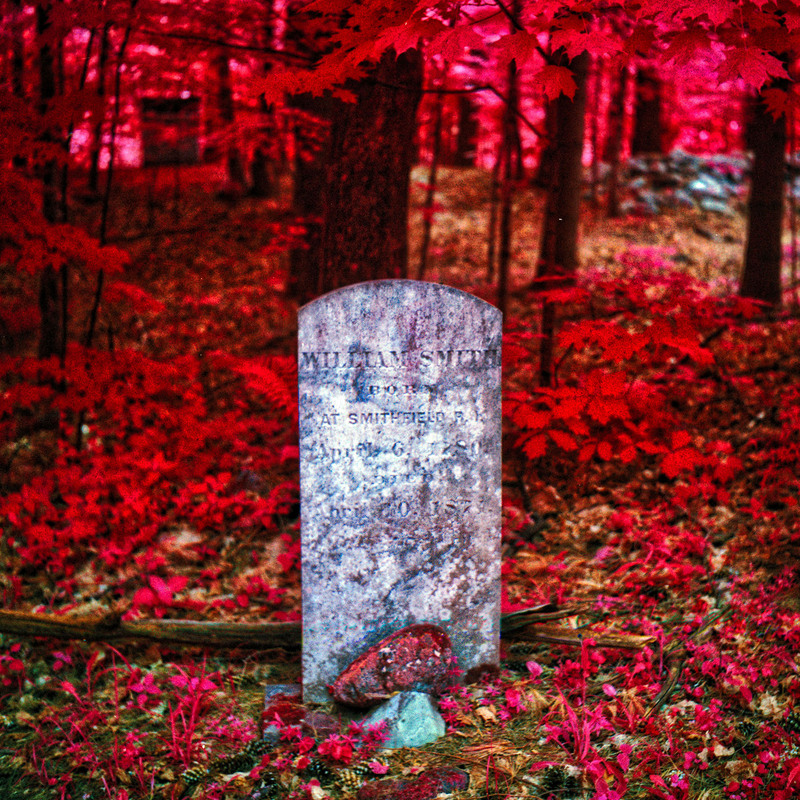 So I can actually get an infrared picture like this, even if I shoot in the shade. Swank. Now let’s keep going on this. I have a feeling that there’s more waycool infrared photos like this. Yeah, I’m having fun with this. And I wanna have some more fun … if you know what I mean.